Strategy To Prevent HIV In Newborns Sparks Enthusiasm And Skepticism : Shots - Health News Every year about 300,000 babies in sub-Saharan Africa are born with HIV. A new strategy aims to reduce these infections by putting every pregnant woman with HIV on drug treatment for the rest of her life. The approach has worked well, so far, in the small country of Malawi. 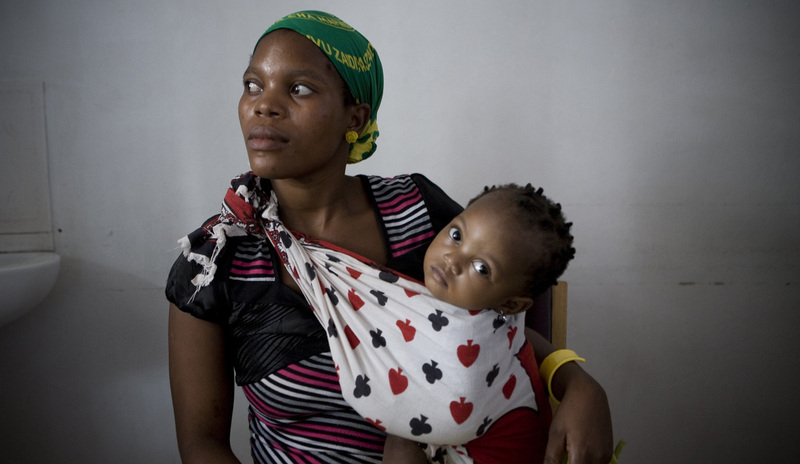 By taking antiretroviral drugs during pregnancy, this Tanzanian mother lowered the risk of passing HIV to her daughter. There's great enthusiasm among some global health leaders about a bold – some say radical — strategy to prevent pregnant women from transmitting HIV to their newborns. But skeptics worry that the approach, dubbed Option B+, will pit pregnant women with HIV against others infected with the virus, diverting resources from the broader struggle against the pandemic. The goal of Option B+ is to make serious inroads in reducing a stubborn and heart-breaking problem. Every year about 300,000 babies in sub-Saharan Africa are born with HIV. The new strategy aims to put every pregnant woman with HIV on triple-drug treatment and keep her on it for the rest of her life — even if the virus has not yet damaged her immune system to the point where she needs medications to preserve her own health. Universal treatment of HIV-positive pregnant women avoids the need to do expensive and often hard-to-access testing of a woman's level of CD4 immune cells to determine if she's sick enough to need long-term antiretroviral drugs. Where is Option B+? Several countries in sub-Saharan Africa, like Zambia, Kenya and Tanzania, are already planning to implement the program. The U.S. government funds Option B+ through the President's Emergency Plan for AIDS Relief. The name Option B+ distinguishes the strategy from two earlier approaches, called A and B, which have failed so far to eliminate mother-to-child transmission of HIV in most-affected countries. Those other options either reserve triple-drug treatment for pregnant women with severely compromised immune systems or provide it only temporarily around the time of childbirth to those whose immunity is still relatively robust. A report, published Thursday by scientists at the Centers for Disease Control and Prevention, finds that when Malawi, a small country in southeast Africa, made a big push to implement Option B+, the payoff was impressive: a sevenfold increase in the number of pregnant and breast-feeding women starting anti-HIV treatment in only a year. "I think this is actually a big deal," CDC director Dr. Thomas Frieden tells Shots. He says the results not only demonstrate that it's possible to implement Option B+ across an entire country, "but that it makes a huge difference. The data are really remarkable." 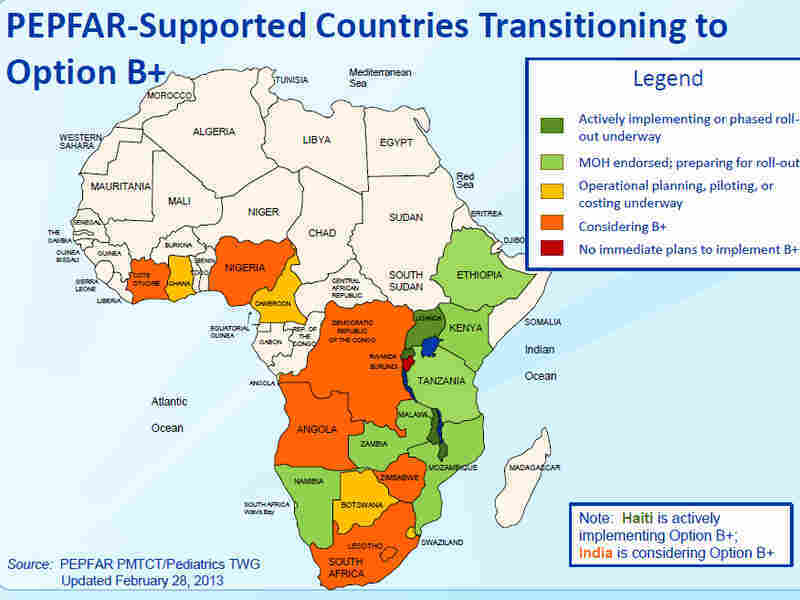 In the space of about a year, Malawi trained 5,000 health care workers to give Option B+. It doubled clinics offering triple-drug treatment and went from having less than 1,300 pregnant women on HIV treatment to nearly 11,000. Frieden estimates Option B+ prevented 7,000 infants from getting HIV from their mothers in its first year of operation. "I think Option B+ is absolutely crucial," Frieden says, "because it gets to people who account for 60 percent of new HIV infections – women of childbearing age." He predicts Option B+ will have ripple effects that benefit families and communities by sharply reducing transmission of HIV from women to their uninfected partners. But not everyone is convinced. Among them is Dr. Hoosen Coovadia, a leading South African HIV specialist, who chaired the International AIDS Conference in 2000, which helped focus the world's attention on the pandemic's staggering toll in Africa. Coovadia tells Shots that he had "a gut reaction" against Option B+ last July "because of the way it was presented" at the International AIDS Conference in Washington, D.C.
"It looked like everyone had been tutored to say this was a great thing," he says. "Hillary Clinton mentioned it in her speech. Almost everyone spoke about B+ as though it was going to change the direction of the AIDS epidemic. But it didn't look to me that there had been adequate consultation. This was a pet program of the U.S. government." After the Washington conference, Coovadia says he and his colleagues debated the strategy back in South Africa. Recently he coauthored a sharply worded commentary in The Lancet calling Option B+ "extreme." "The strong push for countries to switch to B+ is premature," they write. "A switch now would be dangerous, ignoring severe ethical, safety, feasibility and economic concerns." The CDC's report on Option B+ in Malawi this week "is not a convincing argument that B+ is worth all the potential problems," Coovadia says. South Africa, he says, has been able to lower the rate of mother-to-child HIV transmission from 33 percent to less than 3 percent by treating pregnant women with simpler, cheaper regimens and reserving triple-drug treatment for those who need it. One big concern is that Option B+ will create tensions in households and communities when it becomes known that pregnant women with HIV are preferentially getting triple-drug therapy whatever their immune status, while other infected people with deteriorating health may not. "South Africais already a fractious community," Coovadia says. "If it got out that of two women with the same CD4 count, one was treated and the other was not, the scope for tensions would be great." Frieden's response to that: "Why should being pregnant get you to the front of the line? The answer to that, I think, is first, that it's more likely to get the baby protected ... It also saves the lives of the mother, the child, the family and it stops the spread of HIV." And the critics? "Frankly, I think they're mistaken," Frieden says. Coovadia calls for more study of Option B+ before implementing it aggressively. More data will be forthcoming. Rwanda and Haiti have already adopted the strategy, and seven other sub-Saharan countries are actively implementing it or preparing to.